Professor Wally Darwin threw his test tube away in disgust. He had been trying to create this new species of honey-bee through genetic mutation for a long time. But what did he keep getting? The same old type of bee again and again. It had been nearly twenty years since Wally had started experimenting on artificially induced mutation. He had managed to create newer varieties of mutated horses that could run at fantastic speeds. He had created strains of pigs that improved the taste of pork, stronger donkeys and numerous other mutated animals with better characteristics. He had become rich and famous. When the Ranoxy Pharmaceutical Corporation had approached him two years back with a project for creating mutated honey bees that could produce medicated honey for use in the pharmaceutical industry, he had taken it up with gusto. He had thought out his strategy well. 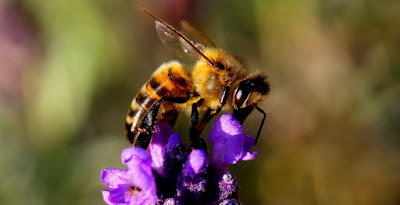 He would induce the kind of mutation that would allow each individual honey bee to convert the collected nectar to medicated honey automatically. ‘Yes, it was indeed I who spoke to you, Professor Wally Darwin. We need to have a conversation,’ said the bee. Wally looked at the bee in shocked silence. The bee spoke, ‘As you know, Professor Darwin, all of us living species including plant life have been put into this planet by mother nature. We can live our lives best by allowing mother nature to do her job by herself. We can co-exist and subsist together by co-operating with her. Plants produce food and get eaten by animals. Animals are eaten again by yet other animals and we have the food chain. The deer and cow graze on plants and the carnivorous animals like lions and tigers eat the deer and cow. You human beings are omnivorous and some of you eat meat while others don’t. Mother nature has been going about her process of evolution merrily and newer types of plants and animals have evolved over millions of years. There were the dinosaurs that lived sixty-five million years ago and perished. There were other fantastic beasts that lived for a while and then became extinct. They were hunted for a variety of reasons. The process of survival of the fittest and natural selection which your namesake Charles Darwin revealed to the world has been going on for millions of years. Why, come to think of it, your own first ancestor stood erect in Africa for the first time two and a half million years ago. You started off as fishes and then slowly through the process of evolution you have today become the Homo Sapiens with a fantastic intelligence. Aren’t you satisfied with the way mother nature has handled your case? Believe me, she knows what she is doing. Now we come to the point I want to take up with you. When you already have such a brilliant natural system in place, why do you want to interfere with it? People of your ilk are up to all sorts of tricks. Genetically modified plants, I can understand but even that is not advisable. You have now started interfering with other animals too. You first started interfering with rats. Then you moved over to pigs and several other animals. Now there is also talk of designer babies. If you interfere with the genes of a human being, god alone knows what Frankenstein monster you might end up with. Other animals and insects like us find you insufferable enough as it is. You have now created what is called artificial intelligence. You are so lazy, unlike us animals, that you want all your activities to be performed by robots. And you are also fully aware that you have no control over what you may end up with as a result of your experiments. And believe me interfering with natural processes can only lead to disaster. For example, look at what you set out to do with the bees. You wanted us to produce honey which could be used to cure human beings of their numerous ailments. But you now have me. A super-intelligent bee with the ability to speak and also the ability to read your thoughts. Good to see that Professor Darwin got the earful or should I say buzzful? Under the guise of advancement and technology, the human race is racing fast in destroying self. Hope we learn lesson before we reach a point of n o return. Very interesting premise Jai. Well narrated. Jai the creatures in your stories are far more intelligent than the humans in them, much like life isn't it? I love the message you are spreading through these lovely posts. Woah! Great narrative and thought provoking post, really made me think about it. Lively and lovely writing and with a message ! Great stuff, Jai.